This is the third photo in the set taken in Joostenbergvlakte. (If you've missed the previous two, click here and follow the trail back to them.) We thought we'd take a drive out to this remote suburb to visit the Wijnland Auto Museum - which, from the outside, looks more like a scrap yard, or an auto graveyard. Sadly, we failed in our objective. We took a quick look around and decided that we'd rather return with a group consisting of other photographers, perhaps, and two or more people dressed up and ready to be models. 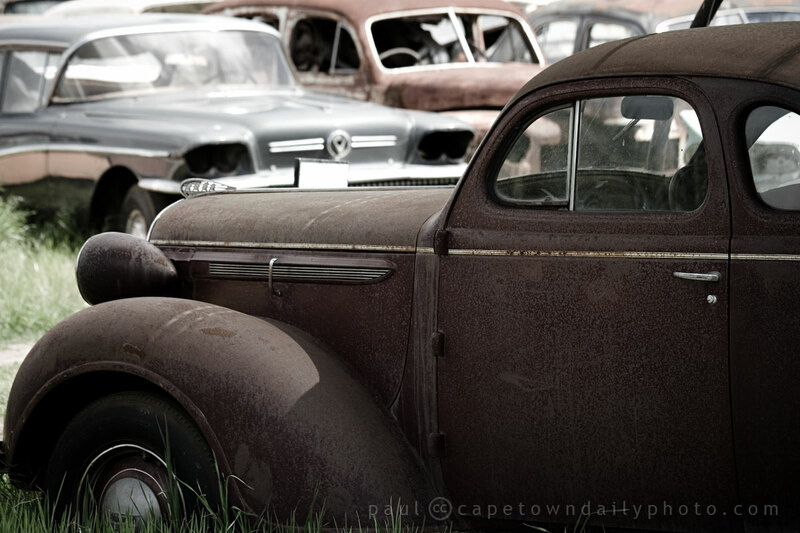 The museum apparently has one of the largest collections of rare cars in the country, and old (perhaps deceased) cars like these make a great backdrop for a modelling shoot - don't you think? Strangely the Wijnland Auto Museum has no website or email address, but they can be contacted by telephone on +27 21 988 4203. The museum is open daily until 16h00 (including Sundays) and charges R50 per person. Posted in Activities and tagged car, history, leisure on Tuesday, 29 September, 2009 by Paul. J’aime beaucoup cette photo de cette vieille voiture. Thanks Olivier, the tall grass growing around it really adds to the mood hey. I dig it too. Paul, this is an awesome photo! I dont think that a score of other photographers (plus models) could have done more justice to the (strange) auto museum the way you did! As a car lover, I’d like to emphasize how disgusting the picture is! Do you know why the museum let the cars rot? I believe the cars often get used in movies. Perhaps the need old cars in movies? I guess the owner doesn’t have enough space to keep them under cover – but yes, it’s a shame that they have to stand out in the weather. Will you please email me your Address for GPS – as I would like to come and visit your lovely Venue over the weekend! I went to the museum two weeks ago. It is a true great experience. I am restoring a oldie myself and it cost a great amount of money and effort to take one of them from rust to shine. I got a car that had nothing missing and relatively in good order and it has cost me R80k and 18 months so far. It not nearly completed yet and will cost a great deal more. The point I want to make is that some cars are just too far gone or too expensive to save. Parts that are missing needs to be specialy made or imported from other continents. Sometimes its just not worth it and make no economical sense to spend the money. I salute Wijnland Car Museum for keeping them on their property together and for the cars that he does rescue and restore to their former glory. Nothing and nobody stops him from selling all those car for scrap metal and making a bundle of cash. The only thing that stops him from doing that is his absolute LOVE for the old cars. That can not be desputed. That’s a good point that you make there Hein. Most of the cars would be so difficult to save, and with limited funds it’s practically impossible to even maintain their current state. So yes, it’s great that he’s actually keeping them vs. selling them off as scrap. If you have a photo of the car that you’re restoring, why not post a link to it here – I’d love to see it.